Here at our house, we eat a lot of Tex-Mex recipes or variations of them. Taco Casserole, Baked Enchiladas, Mexican Rice and so many more fill our menu month after month. One of my favorite recipes though is my homemade beef taquitos recipe. Why is it my favorite? Aside from the taste, I often use leftover beef to make them so they’re a super cheap family meal idea and you should know by now that I love anything that saves me money. I believe in having a planned menu monthly and these are on mine every single month. We love them that much! 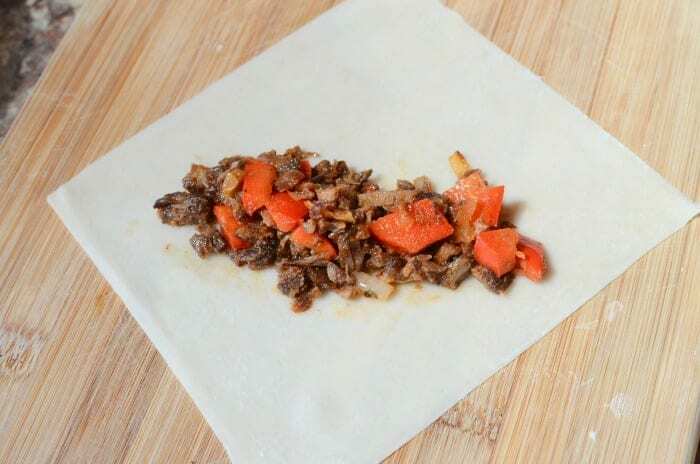 As I said above, when you make these homemade beef taquitos, you can use either fresh roast beef or if you happen to have leftover beef, you can use that too. I love to use the leftover beef when I make my open faced roast beef and cheddar sandwiches. It won’t make a difference in the taste whatsoever! When you add in the homemade taquito dipping sauce recipe that I’ll include below, you get a delicious meal that is actually easier to make than you might be thinking! They cook up in about 4 minutes once you’ve got them made and even better? They can be frozen for later! Cheap, easy freezer meal? Yes please! When we make our own homemade beef taquitos, we serve them with the sauce that I’m including along side of a side of mexican rice. Add some queso and you’ve got a meal! If you eat them by themselves, they make a great lunch or snack recipe! If you want to freeze them, cook as directed below and cool completely. Wrap each taquito in parchment paper or butchers paper and freeze in an airtight container. When you’re ready to eat them, just pop them in the oven or microwave. In a medium skillet, saute’ the onion and beef with a splash of oil or a bit of butter. 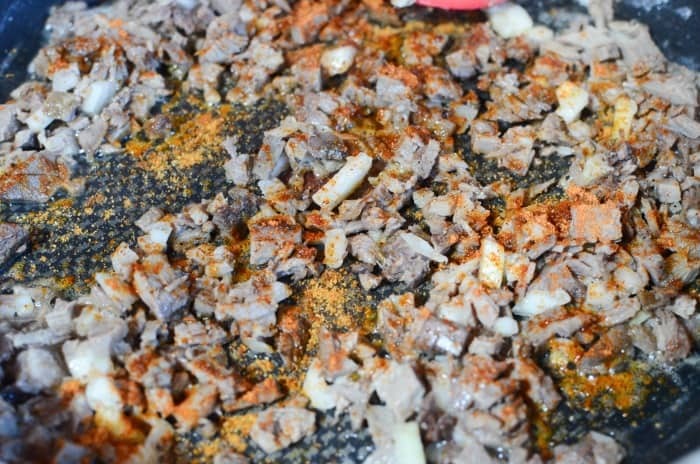 Once it is heated, sprinkle the taco seasoning over the mixture and cook until the onions are soft and fragrant. Stir in the 2 tbsp of salsa and stir to combine well. 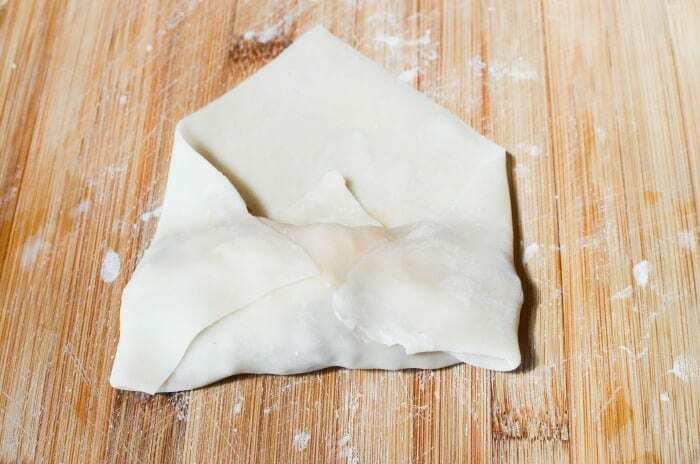 On a wooden cutting board or your kitchen counter, lay one wonton wrapper down so that it forms a diamond shape to you. Scoop out 1 heaping tablespoon of the filling into the wrapper. You want to try and get the filling into the lower 1/3 of the wrapper like shown. 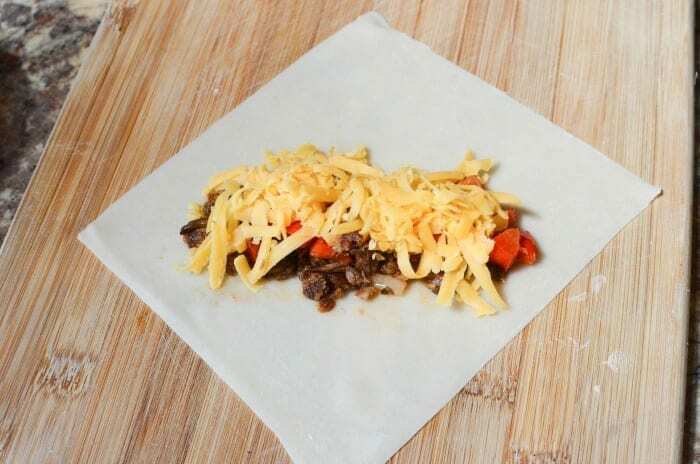 Divide the cheese into 8 portions and sprinkle one portion on top of the taquito you’re working with. Grab the wonton wrapper by the bottom and fold it up over the filling. Make sure that you get it tight against the bottom of the filling. Next, take the right side of the wrapper and fold it to the center. Again, make certain that the edge is against the filling. Repeat with the left side, folding it in to the center. Yes. 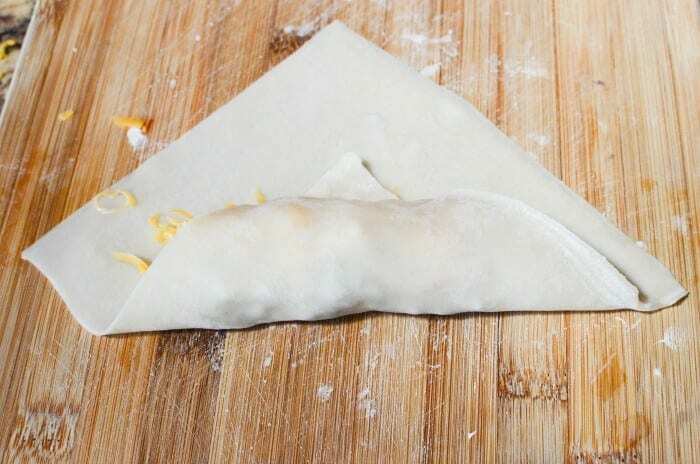 You just created a wonton envelope. No, you can’t mail this one. Dip your finger in a bit of water and use it on the underside of the left and right edges to help create a seal. Roll the rest of the wonton wrapper tightly until you reach the top. Again, use your finger with a bit of water on it to create a seal on the end of the taquito. If using your finger dipped in water isn’t something you want to do, you can also use a pastry brush dipped in water. Just be sure that you don’t soak the taquito. You only need a tiny bit of water to create a good seal. To cook, preheat a deep fryer to 350, and cook taquitos for approximately 3 – 4 minutes or until they are golden brown. If you would rather fry on the stove top, you can do so the same way making sure that you turn your homemade beef taquitos often so that they don’t burn. They can also be cooked in the oven in a baking dish on 375 for 15-18 minutes or until golden brown. 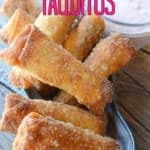 While your homemade beef taquitos are frying, mix up the dip! Simply combine the salsa, sour cream and hot sauce in a bowl. 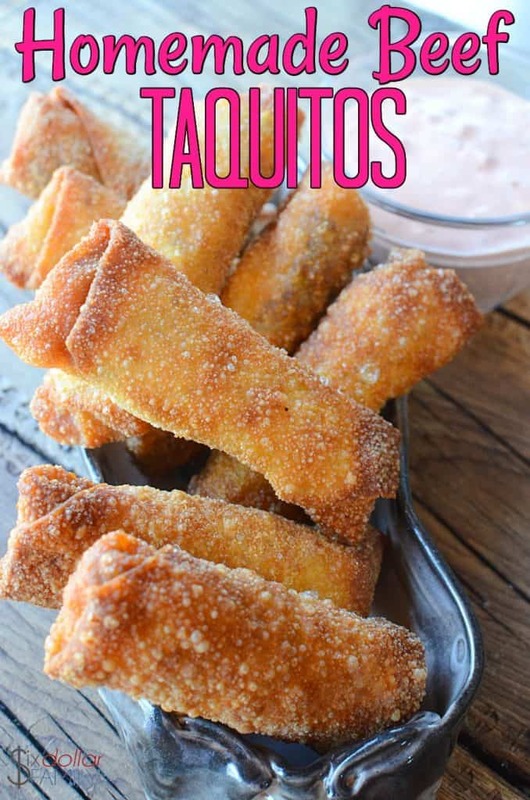 Mix well and either dip the taquitos into the dip or use a small spoon to spoon out the dip on top of the taquito onto a plate and enjoy! Add the salsa to combine, and remove the pan from the heat. Set aside. Place approximately 1 full tablespoon of filling 1/3 from the bottom, onto the wrapper. Dividing the cheese into 8 portions, sprinkle one portion onto the top of the beef filling. Dip your finger in the water and use it as a glue to “glue” down the ends of the folded over wrapper. Roll the rest of the wrapper towards the top, again using your finger with water to “glue” the last corner down so the taquito is sealed. 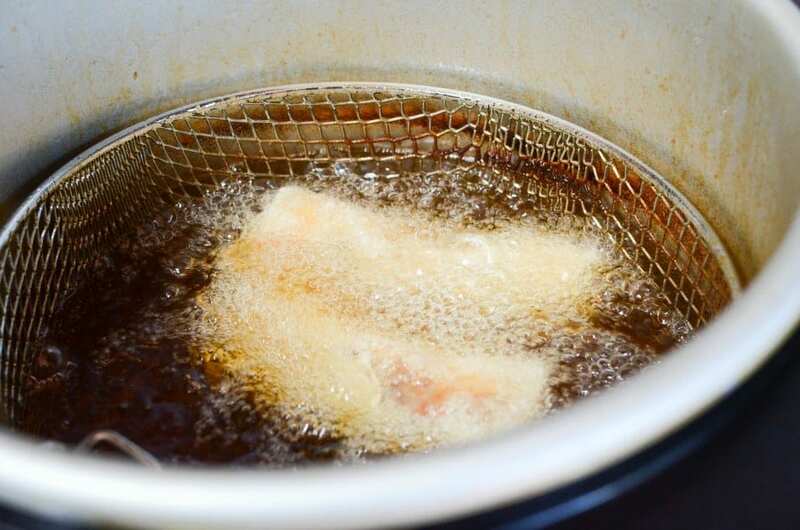 For stove top frying, place approximately 1” to 1.5” of oil in the bottom of a heavy fry pan. Heat to 350, and fry the taquitos for approximately 4 -5 minutes, turning frequently, until they turn golden brown. For Oven Baking, preheat the oven to 375 and bake the taquitos until they golden brown, approximately 15 – 18 minutes. 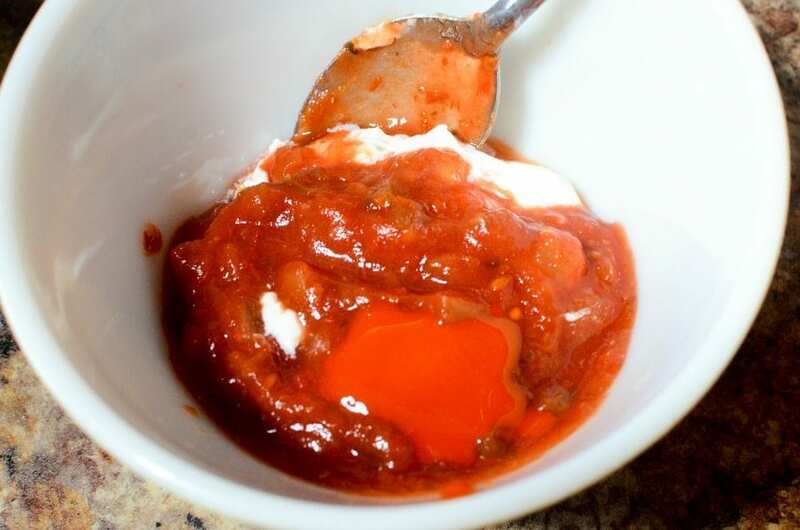 Simply combine the salsa, sour cream and hot sauce in a bowl. Mix well and either dip the taquitos into the dip or use a small spoon to spoon out the dip on top of the taquito onto a plate.